This green bucket style Irish hat for St. Patrick's Day features dangling shamrocks and a furry material. This St. Patrick's Day hat features a cotton lining and a 1/4" thick foam interior that will provide durability and support. The shamrock hat also has wire in the brim for custom shaping. This St. Patrick's Day hat features dangling shamrocks and a fur like texture. The green Irish bucket hat would be an ideal accessory for any Irish costume and it is made of cotton and velvet blend. 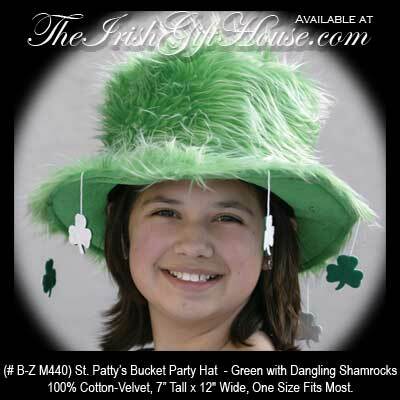 The shamrock hat from The Irish Gift House measures 7" tall x 12" wide and the one size with its adjustable Velcro strap will accommodate most smaller adult head sizes.